Note: If you just want the results, read the final few paragraphs. If you want all the details, read on. Also, you can click on any image to obtain a larger version. I had really good luck in my first triathlon in "modern history": the Wildflower, where I won first place in my age division. 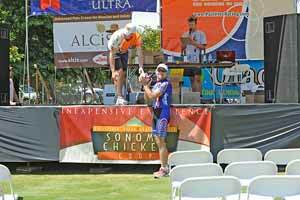 Here is my Wildflower race report. 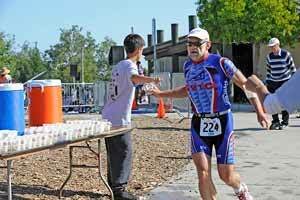 But Wildflower is a very hilly course, and relative to others, I'm much stronger on the hills, and the San Jose International Triathlon (SJIT) is almost dead flat. There's one minor hill on the bike, and the only "hills" on the run are when your trail goes under a freeway a couple of times. Here is the SJIT web page. But I thought I could do pretty well: My coach asked me beforehand how confident I felt on a scale of one to ten about being in the top five, and the answer was, "Ten for sure, but I'm not going for fifth place!" I was in good physical shape and did all the assigned workouts. The only problem I have is a sore shoulder that's been bugging me for some time. It just hurts after I abuse it, and it's not really painful: just an ache. I figured I'd just go all out, ignore the pain, and have an ache-y night afterwards. My other minor problem going into the race was that I'd decided to save time by not wearing socks for the bike and run portions. I'd tested the bike sock-free, and that worked great, but my sockless running test a week before the race had not been so great. I had little blisters all over my feet, and a couple of big ones behind my ankles. My plan was to put duct-tape over all the sore spots, and I did that the morning of the race. But I did take a pair of socks to the start figuring I could decide at the very last minute whether to mess with them or not. 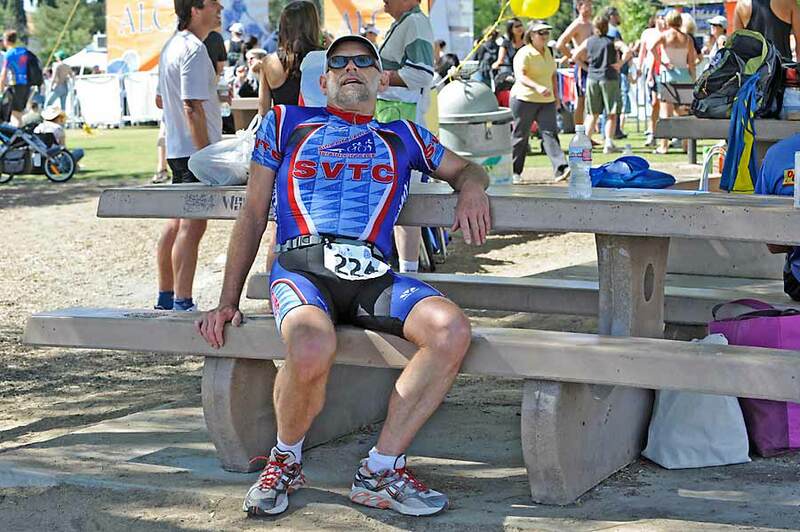 My triathlon club (the Silicon Valley Triathlon Club, or SVTC) had reserved a few bike racks right in the front of the transition area. It turns out that the way transitions worked were incredibly fair: everybody was required to run through the whole area, each time, no matter where their stuff was set up, so nobody had an edge by having a sweet location. It was really nice to have the reserved racks, though: everybody around was a club member, so all my club friends were nearby, and I met a bunch of folks whose faces were familiar from club meetings but whom I'd never met officially. Since the race is local (20 minutes from home) my wife came with me, and that was nice: she dropped me off at the event and then parked, and she had the camera and could also be a cheerleader at all the transition points. The first wave started at 7:00 am and waves left every four minutes after that, and mine, the "men 50 and older" wave, started at 7:28. It's a slightly shorter swim than normal (which is bad for me, since I'm relatively best in the water), but given the size of the lake it's about the best they could do: we swam around the outermost edge, then out to a buoy in the center and back to the finish. 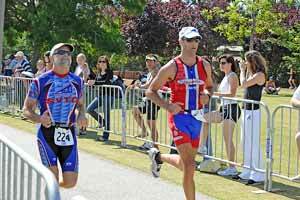 The fastest pro swimmers do it in about 14 minutes. 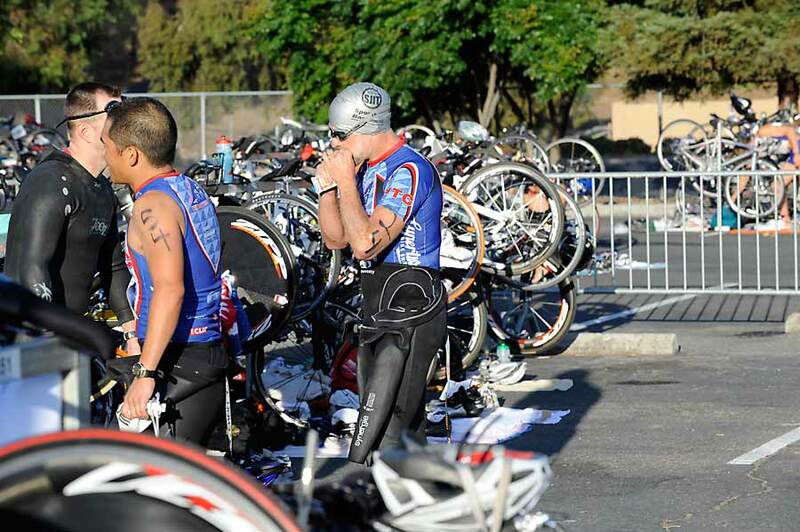 Here I am in the transition area, just about ready to head out to the start. I got in the lake and swam around for a bit to warm up, and watched the other waves take off. The water was pretty warm, so the wet suit was basically just for buoyancy. The swim portion went fine: this time I didn't "get lost", and stayed almost perfectly on-track from buoy to buoy, coming within inches of each one. One reason for this is that I paid a lot more attention to my "sighting", but also I had prescription goggles, so I could actually see pretty well while I swam. I'm pretty near-sighted, so things in the distance are a blur to me without vision correction, and sometimes a nearby orange cap looks like a far-away buoy. Here I am coming out of the water. 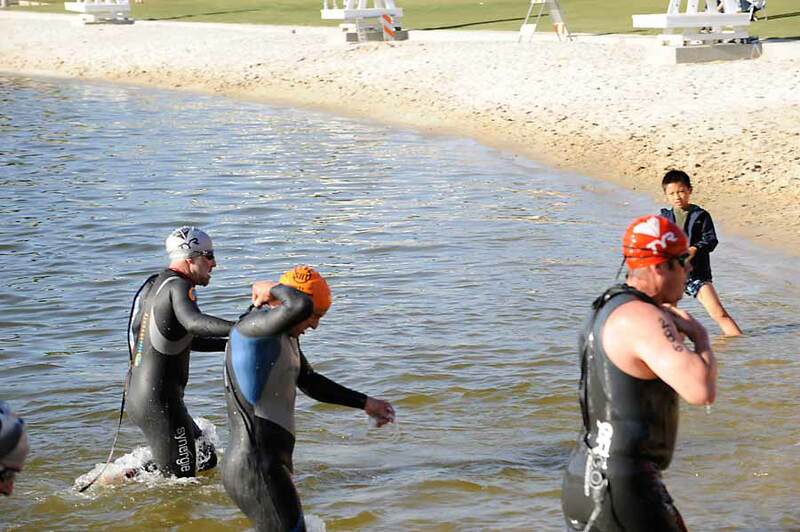 I'm in the gray hat; the other two folks are from waves ahead of mine. My wife told me I was number four out of the water in my group, but that included everyone from age 50 on up. 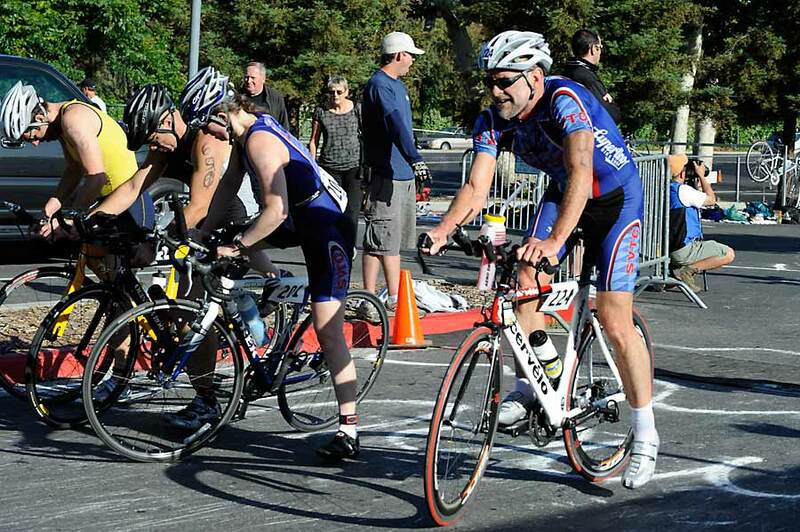 I was racing against the 55-59 year olds, so I don't know exactly where I stood, age-group-wise. As I type this, the official results have not been posted. When they are, I'll append that data to the end of this article. My swim time was 20:29, which is pretty good, at least compared to the times from the previous year. I had a hard time getting off my wet suit at the transition: one of the legs got stuck, and I messed with it for perhaps 30 seconds. I think the problem was due to the hasty lubrication of one leg at the start. The total transition time was 4:03. We'll see, when the official results are posted, just how good or bad that is. It's probably not great. I did put on socks, too. As I'd hoped, once on the bicycle I felt like a god. I could pass almost everyone, and only people younger than me passed me except for one 60-year-old and he and I passed and re-passed each other a few times. I mostly used him (and he, me, probably) as a "rabbit", since we were in different age categories. Here's the bike start. I'm on the red and white Cervelo. I was able to stay in "aero-position" (laid out flat on the aero-bars) for the whole race except for the exact same three places I'd planned not to be: on two of the hills, and for one 20-pedal-stroke session about 3/4 of the way through the race were I figured my back would be sore and I'd need a short break. On the main part of the route, I slowly passed people, but on the "major" hill (not major at all by any reasonable measure) I was passing folks right and left. I was out of the saddle the whole time, and an amazing number of the folks I passed were trying to climb in aero-position, which, to my mind, is just nuts. 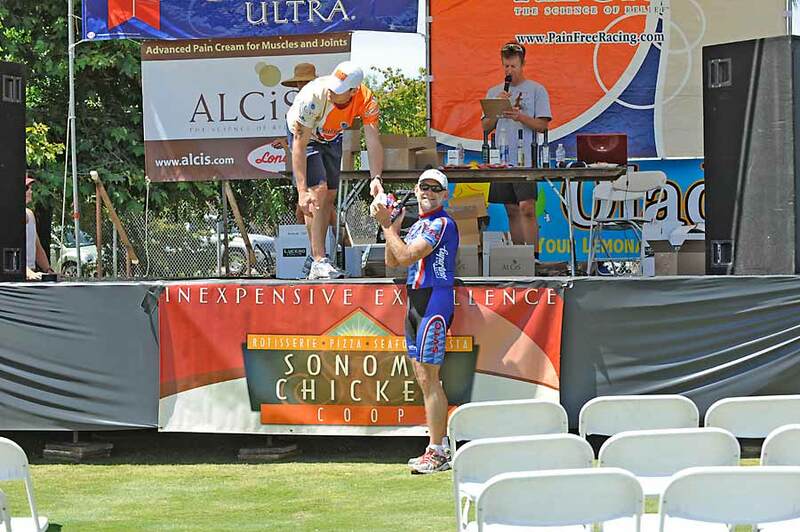 I had test-ridden the bike course a couple of weeks before the race, but I did it fresh, not having just done a swimming race, and I had been able to finish in about 1:12. On race day, with the surging adrenaline and testosterone poisoning, I did it in 1:09:28. I think I could even have gone faster, in retrospect. Here's the run start. I'm taking my first of many cups of water at the aid station outside the transition area which you can see in the background. The bike/run transition couldn't have been better -- 1:23 -- and then I was off on a flat, miserable, hot run. I instantly started using my "race mantras" on the run. I was pushing hard, and there are a couple of really discouraging parts to the race. First off, there's an out-and-back of unknown distance right at the beginning to make the race measure 10k exactly. I didn't know where the turn-around was, and as you're going out, at every turn you see people coming back as far as the eye can see. Then back to near the start and off for another loop in a different direction (again, with an unknown turn-around). In addition, there are two places on the course where you effectively run around big lakes, and you can see runners stretched out all the way around. I like it better when you can't see how depressingly far it is. And one of the "around the lake" views occurs at the end. Finally, the course was short of mile markers, or at least I didn't see any until mile 4, and then there was one at mile 5. Because of my good luck at Wildflower running without a watch or heart-rate monitor, I did the same at SJIT, but without a watch, I had a hard time knowing even approximately how far I'd run. Here I am on the left a few steps from the finish line. I'm finishing right next to the SVTC club president! On the right is me a few seconds after the finish. Anyway, I just pushed and pushed and pushed, and although I did pass quite a few folks, I was passed by quite a few, although none of them were in my age group. At the end, I was confident that I'd done well, but didn't know how well, since there had been swimmers ahead of me who might have been in my group, and I did foul up T1: the swim/bike transition when I couldn't get the wet suit off. 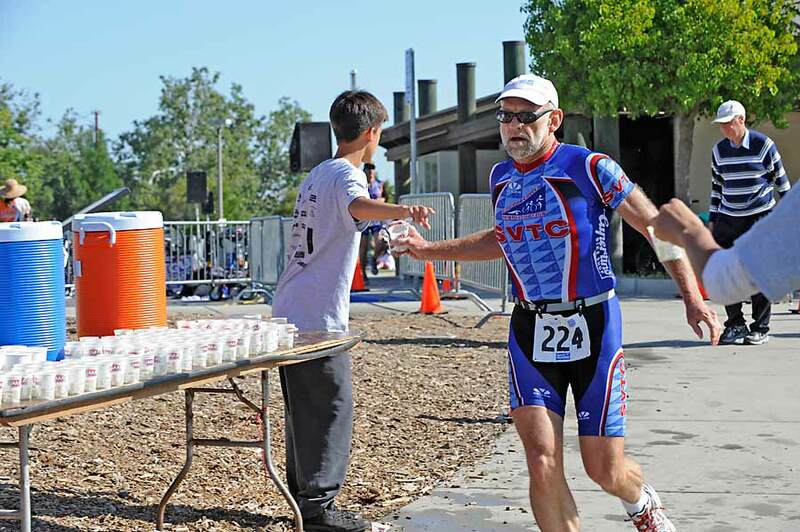 My running time was 49:22, for a total race time of 2:24:47 -- almost 20 minutes faster than at Wildflower, but I'd expected to do better with the shorter swim (1250 instead of 1500 meters), and the almost dead-flat bike and run course. Wildflower was very hilly. Here I am getting my award. But miraculously, I did win first place in my age group, and I think it was by a couple of minutes! As I said earlier, I'll append the official results to the end of this article when they're posted on the website. My prizes included a bottle of nice olive oil from one of the sponsors, some Alcis cream to rub on my sore shoulder, and a pair of nice swimming goggles. It was a fun race because there were about 50 folks from my SVTC triathlon club racing, and many were wearing "the colors", so we could cheer each other on. I almost stayed on-plan with respect to eating and hydration: I ate a Hammer Gel "espresso" pack 20 minutes before the start, I ate one Accel Gel packet on the bike (was planning to eat two, but forgot the second). I drank all the Cytomax (about 23 ounces) on the bike, drank a few sips from my water bottle, and drank almost an entire bottle of water that was handed to me at the top of the one hill on the bike course (on Bailey Avenue). On the run there were lots and lots of aid stations, and I took on water at about half of them. It was great to have so many. I didn't have any sugar drinks on the run: didn't feel like it, but I sure felt like drinking water, so I did. This time I brought my own photographer along (my wife) so when this is eventually converted to a web page there will be some photos! Here are the results for the top six men in my age group. Even my first transition time wasn't too bad; I guess I lost about 30 seconds with the stuck wet suit. 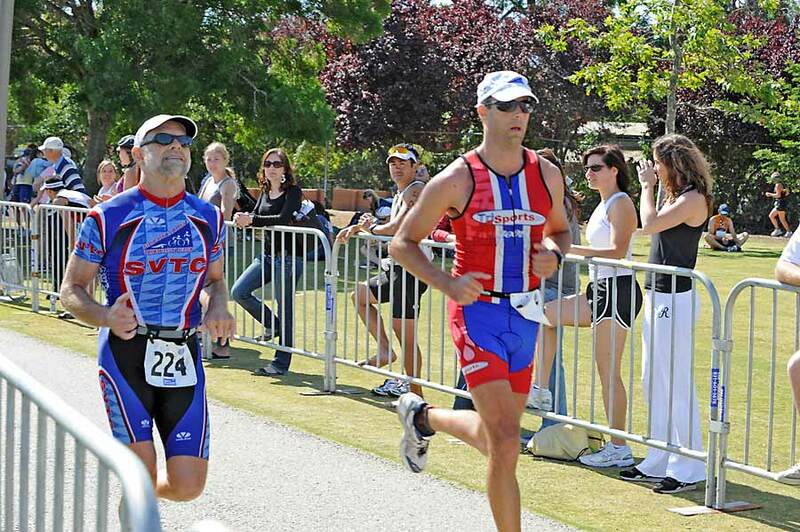 In fact, looking over my entire age group only four people were faster in T1 and only one person was faster in T2. I had both the fastest swim (and big surprise) the fastest run in my age group as well. Even though I felt like a god on the bike, two people beat me.